What The Hell Is Going On With Tickets For The US Grand Prix? 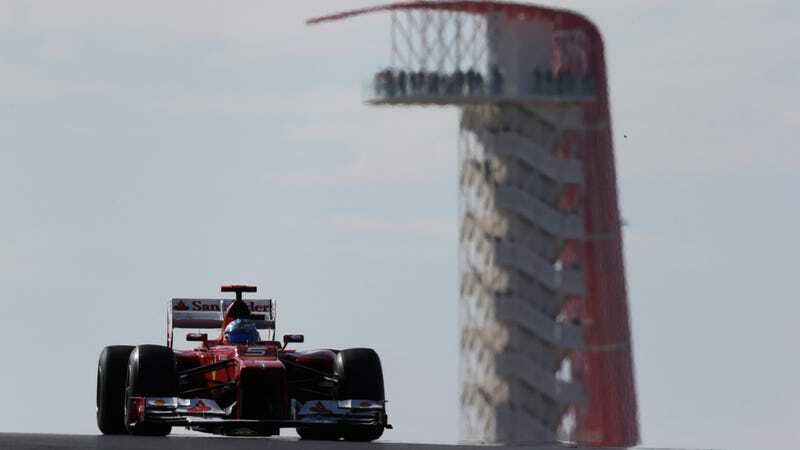 It's the week before the United States Grand Prix—do you know where your tickets are? Lucky you, then. Until I got my tickets late yesterday, I thought mine were wherever Kimi's paycheck is—completely missing in action. Other fans? Not so lucky. dapper_otter ordered our group's set back in March, right when tickets went on sale. We wanted seats that were high on the Turn 12 grandstands, plus we wanted to sit as one happy pack of masochi—err, uh, past and present Mitsubishi owners. Tickets were supposed to ship in early October, giving international fans plenty of time to get theirs in time to travel with them in hand. Initially, the circuit delayed delivery to October 22 (per mandingo on local sports forum ShaggyBevo), and told customers to expect the package via FedEx. Then October 22 came and went, and the official word became "in the next week or two." We locals are lucky in one regard. If you tell me that my tickets are available the week of the race at the airport Hilton or something, I can probably drop by at lunch and pick 'em up. Problem is, this isn't just a local event, and when you're already delaying shipping tickets to international attendees during the month of the race, well, you have a very big problem. Send them too late and folks won't be at home to get them. Travel plans for grands prix are made months in advance and can be difficult or expensive to change at the last minute. Things just got weird from this point onwards. When I tried to look into the reasons why my tickets were vaporware for the entire month of October, the only common thread I could find in any of the reported answers was that COTA officials were giving folks a lot of conflicting information. First, the date they were supposedly mailed kept changing. Then, the remaining issues were only with customers whose addresses had changed. Or that local tickets were being mailed out last. Our F1 USGP tickets have been shipped. They went out a week later than we originally anticipated due to some design and informational updates that Formula One Management required us to make to the ticket stock. We apologize for the delay, but guests should be receiving their tickets via FedEx or through the U.S. Postal Service, depending on whether they purchased them from COTA or ordered them online through Ticketmaster. We are currently working to identify updated addresses for some patrons who may have moved since they placed their orders, and will get those fans their tickets as soon as possible. We know everyone is eager to have their tickets, and we’re working to make that happen. One more issue: let's define what people expected as "their tickets." Last year, those of us who ordered tickets before the event got beautiful full-color tickets with foil inlays and slick graphics. One of my coworkers still has hers posted to her cubicle. dapper_otter said he planned to frame his from this year and last year. We just got word from our ticketing team about who gets commemorative tickets. All 3-day tickets purchased through Ticketmaster—with the exception of PSL holders, suites, Loges, RVs, premium seats holders—will receive regular tickets. People who purchased 3-day tickets directly through the COTA office before Oct. 8 will receive commemorative tickets. Single-day ticket holders almost all receive regular tickets. We apologize for the any confusion. We're definitely taking fan feedback into consideration for next year regarding this. Thanks again for your support and patience. Please let us know when you get your tickets. Given that COTA directed many of us to order through Ticketmaster and that no such distinction was made between Ticketmaster sales and the other tickets before, this has come as an unpleasant surprise to many. Tickets are also arriving via USPS with no tracking, which doesn't seem like a fair trade-off when shipping cost $15 and was originally promised to be FedEx—with tracking. Circuit of the Americas' default answer to all outstanding ticket woes thus far has been if your tickets did not arrive by the end of this week, they would be available at will call. Unfortunately, many ticketless customers are also waiting on parking passes, and not even the four-lane road that runs through Circuit of the Americas' property is equipped to handle a massive queue of cars outside of the plaza by turn 15. I am not usually one to pile onto Circuit of the Americas' management for minor issues that arise with their events. COTA is a spectacular facility, an incredible place to watch racing and a fabulous new playground that's in my backyard. I can overlook small missteps as growing pains for a new facility (for now, at least), and I generally give them a lot of leeway when it comes to figuring operations issues out. However, when people are threatening to boycott the race to solely go to Canada's grand prix instead—where they'll presumably receive their glossy commemorative tickets on time—that's a threat to the continued existence of the playground, and something that COTA needs to make right if they'd like to keep attracting track events, participants and spectators. Add to all of this a thinner than usual list of support races—two instead of last year's three with the loss of GT3 Cup—and this ticket snafu is just salt in the wound, man. I care more about the race schedule I'm paying to watch than I do the commemorative tickets. I would have liked to either see GT3 Cup stay on the schedule or something else—perhaps a lower formula series with a lot of young talent—take its place. COTA needs events like F1 weekend to be successful—not just for their sake, but for Austin's, for Texas', for the growth of road course shenanigans in America and for hoons everywhere who'd like to drive the thing. At this point, I and many others who haven't received the tickets they were expecting on time don't want PR speak—I want a straight answer as to why I suddenly have less fancy tickets than initially expected. Specifically, I want an answer that isn't going to change depending on who I speak with. That would go a long ways to rebuilding trust with the fans who are fuming mad over this ticket ordeal. I realize there's been an effort to reach out to fans who have been bombarding the circuit's social media and customer service lines with complaints, and I appreciate that. However, it would be much more helpful if everyone who is trying to help customers find the status of their tickets gave the same reason as to why things were running late. Circuit of The Americas deeply regrets any inconvenience caused to our guests by the delay in shipping tickets to this year's FORMULA 1 UNITED STATES GRAND PRIX. All tickets and parking passes that have been purchased in advance of this year's race were shipped or mailed this week and should be delivered no later than Saturday, Nov. 9, 2013. Our ticketing team is currently working to ship tickets to guests who may have moved or changed addresses since placing their F1 USGP ticket orders with us. 1. Visit Circuit of The Americas' downtown office location at 301 Congress Avenue, Suite 275, Austin, TX 78701, and a member of our team will provide them with replacement tickets and parking passes. Circuit of The Americas' WELCOME CENTER located in Austin Fan Fest at the corner of Lavaca and 4th Streets. This information is available online at www.circuitoftheamericas.com. It's not mentioned in the release, but I would recommend bringing along some form of ID along with any receipt or confirmation email you have on hand when you go pick these up—just in case. Good luck!